April started off at Pho, one of my favourite places in Brighton for a reliable, healthy meal with great service. 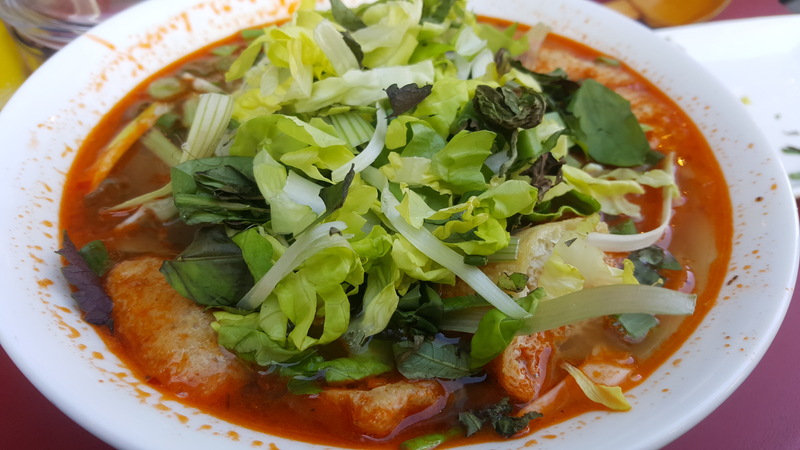 I love the bun rieu which is a tomato and crab based broth including skirt steak, puffed tofu, crab pate, fresh tomatoes and loads of salad and herbs to pile in. 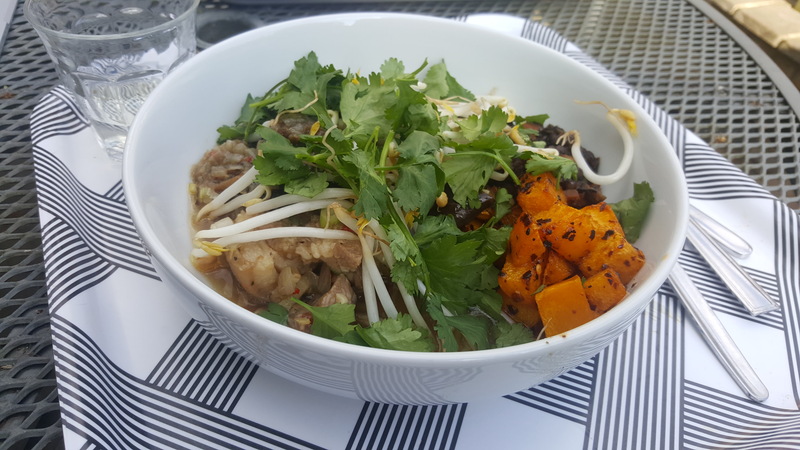 I would recommend trying it as a nice alternative to standard pho as it’s packed with flavour and just delicious. One of our friends is Chinese and every year has his birthday at Gars. We always get the set menus and I take the hit and eat what I can, however this time I thought I would ask if they did cater for gluten free. I am so glad I did as it was brilliant! 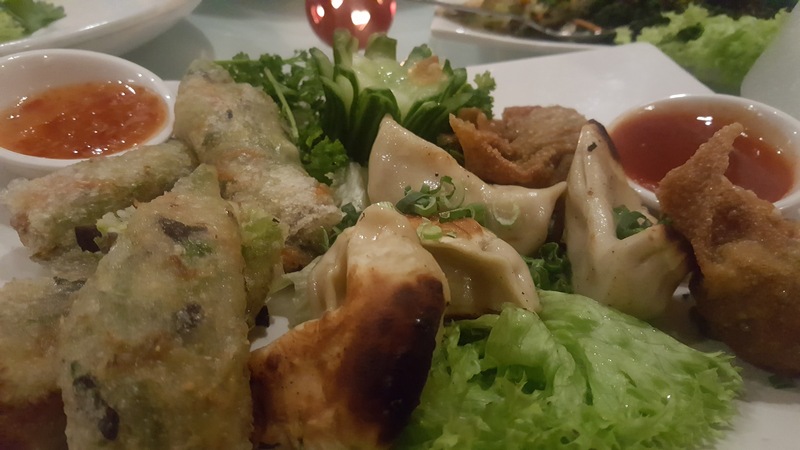 The above pic includes a whole plate of gluten free dim sum all for me and I had loads of other dishes, including lettuce wraps instead of pancakes with the Chinese duck. I appreciate it’s hard for Chinese restaurants to offer gluten free as wheat is in so many of their dishes so hats off for them for doing it! I would definitely recommend it, so make sure you let the restaurant know when booking! As you may know we live Coldean way, near Stanmer Park. 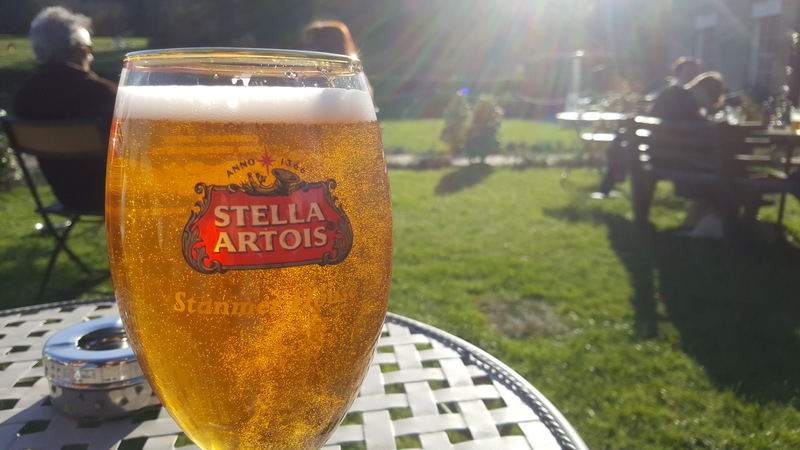 Our weekends are often spent walking through the woods and sitting in the park with a cider (or two) and on the first Sunday of the month we went and sat in the garden of Proud Country House which was beautiful. They had an acoustic singer playing chilled music, the sun was beating down and it was all rather lovely! They are now offering bottomless brunches in the weekend which I am tempted to go to with the girls to try out… I haven’t had food there recently though so I’m not sure what it’s like! If you haven’t heard or tried Semolina, you need to change that stat. I work close by and had been planning to catch up with a colleague for lunch one day for awhile. She had seen the latest lunch deal menu on Instagram so we booked in for lunch the next day. It’s £12 for 2 courses so an absolute steal! 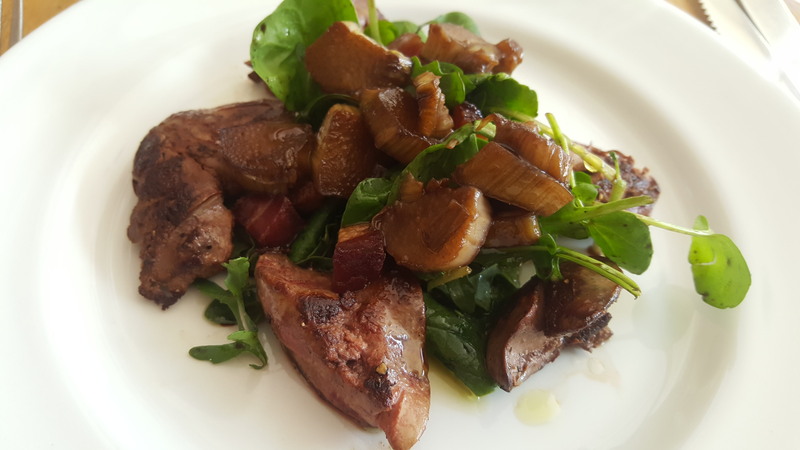 I had the chicken livers with rhubarb to start with and it was cooked perfectly and just beautiful. 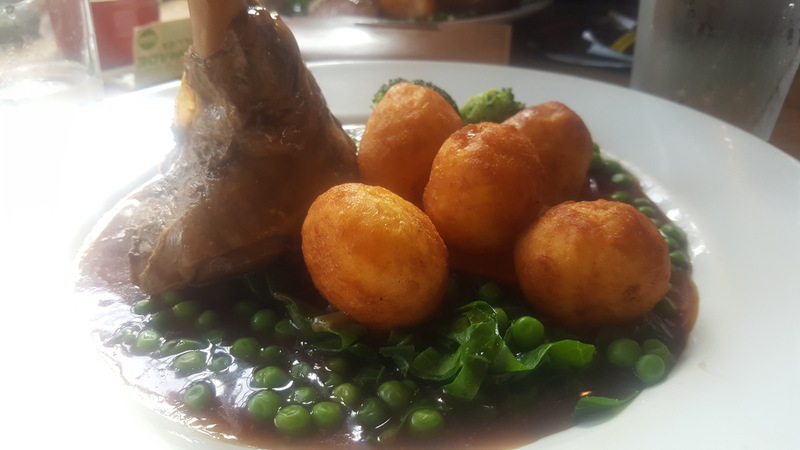 Their Sunday roasts are meant to be very good, I keep meaning to try them! 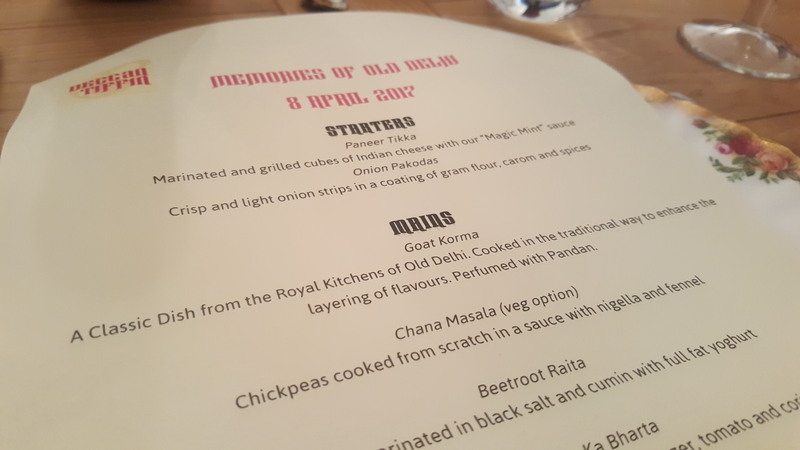 Deccan Tiffin held another of her fantastic supper clubs, so I had to go this time especially when I saw the main event. I went in February for my first time and was blown away by the flavours and love that went into the dishes. I took a friend who had just come back from India who was equally impressed as me and keen to get to more events in the future. Once again it was a lovely evening with beautiful flavours and great company. Priya recently also held a pop up at Cafe Plenty which seemed to go down very well! I am keeping an eye out for her next one, you can view upcoming events on her website. 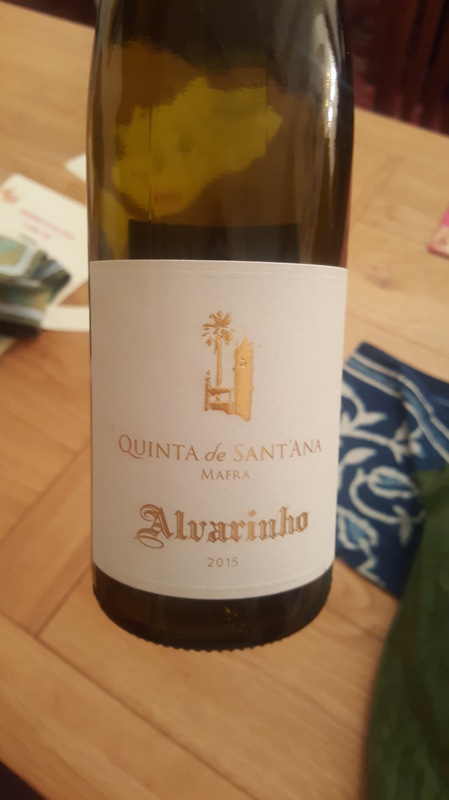 For dinner that evening we took along a bottle of this gorgeous Portugese wine (sorry for the long pic I am being lazy!!). We bought it from Fourth and Church, I think my favourite wine bar and shop in Brighton and Hove. They act as a wine shop from 10am – 10pm as well as serving a weekly changing menu of wines by the glasses, cheeses, charcuterie, house pickles and cured fish and meats and small plates which are tapas style dishes inspired by the owners travels. The food menu changes often too so you can always go along and try something different. Again, if you haven’t been there you need to STAT. It’s been getting a warmer (apart from a couple of cold weeks lately) but salads have been made and BBQ’s have been smoking. This is a salad that a friend of mine used to make when she lived in Brighton and it’s super easy and so delicious! It went down well let’s put it that way. 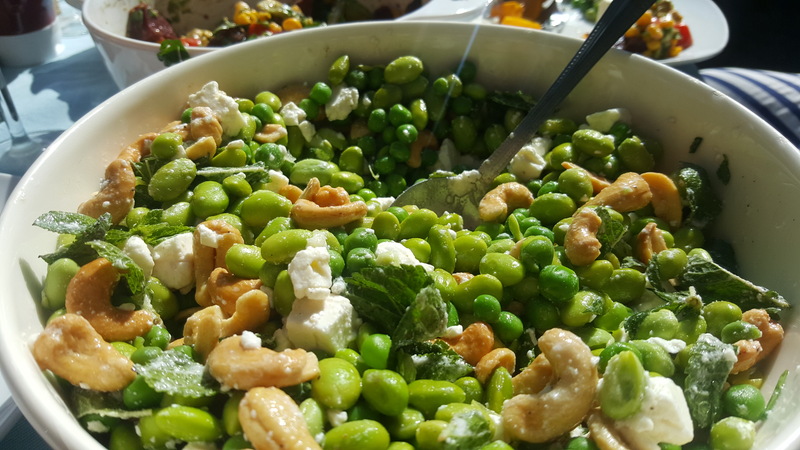 All you do is cook the edamame and peas and immediately cool, add chopped feta, salted cashews, fresh mint and then dress with EVOO and the juice of two lemons. I add the zest as well to make it extra zingy. Try it! 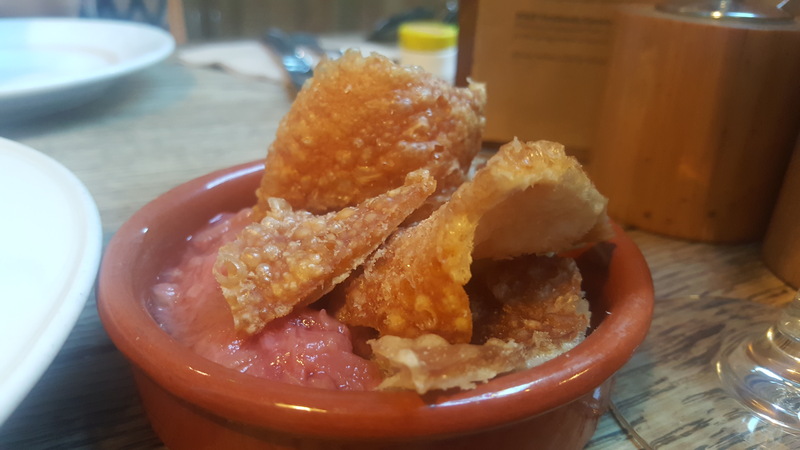 I went to Hove Place to write a review about their new small plates menu in April. OMG it was so yummy, everything we had was cooked really well and was tasty. There are loads of small plates to choose from for all sorts of dietary requirements and I think would be great in any sort of occasion. 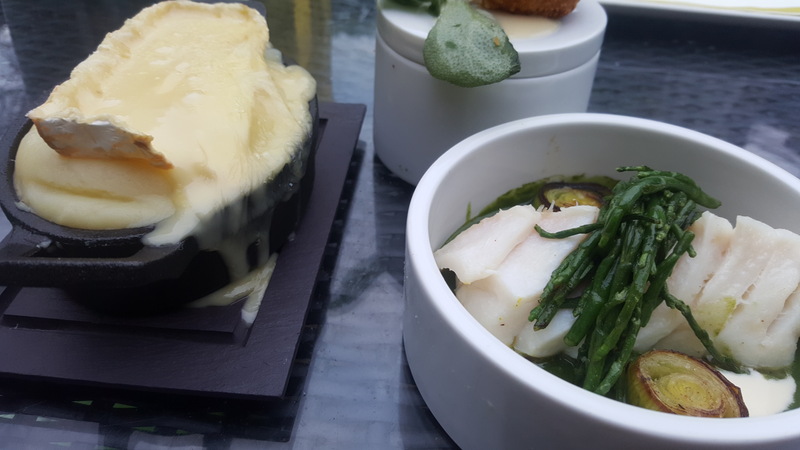 In the pic we have truffled mash with truffle brie and then skrei cod in a watercress puree with buttermilk and samphire. It’s such a great spot for alfresco dining and drinking in the sun, and now they have the small plates it’s made much easier for grazing. Every Monday – Friday lunchtime the Temple Bar offer a great lunch deal with a specific menu for £6.50. 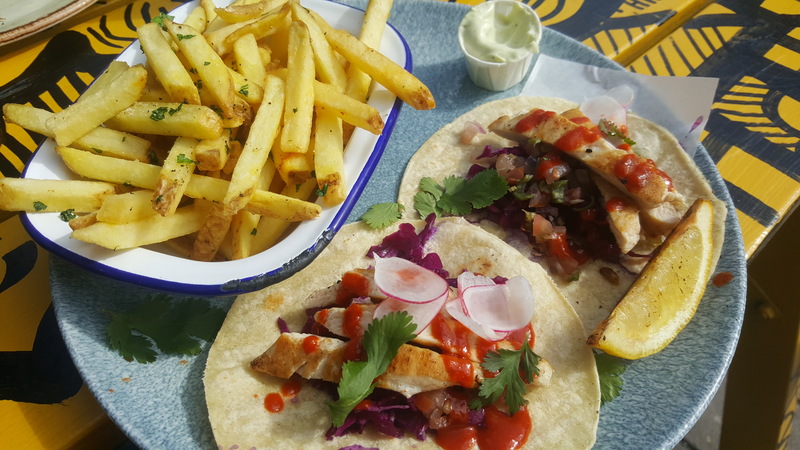 This was the chicken tacos (gluten free) served with fries which is a bargain as usually this would cost you at least £9 . 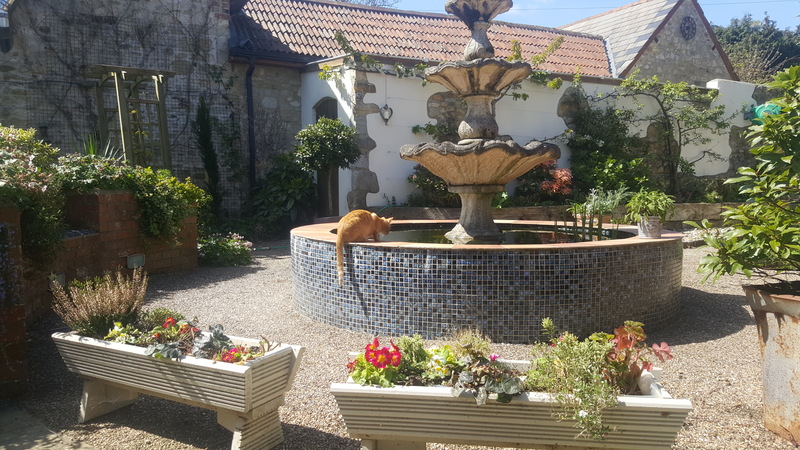 It was lush sitting in the sun outside (albeit a few weirdos) but if you’re down that way during the week check it out. Over Easter weekend we had some friends come down to visit and stay with us in Brighton. 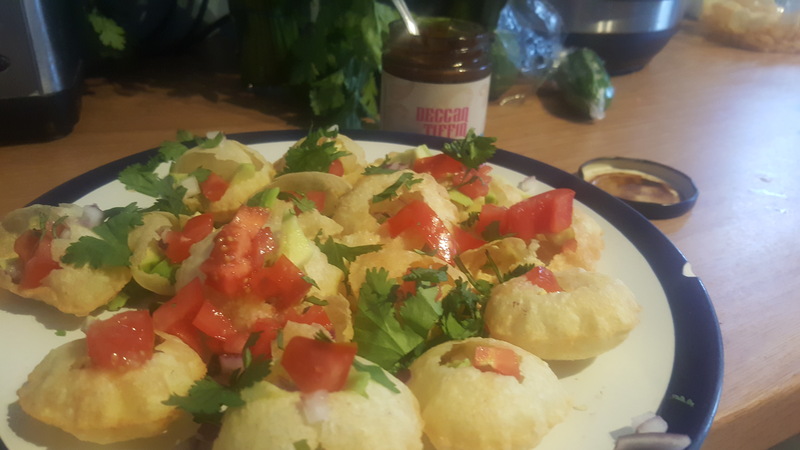 Inspired by Deccan Tiffin’s cooking I made an Indian feast including saag paneer, bombay potatoes, Keralan fish curry and these bhel puri served with her very own tamarind chutney. It went down very well and everyone was happy! It took ages but it was so much fun, I love slow food and cooking over the day, it’s seriously one of my favourite things to do in the weekend. 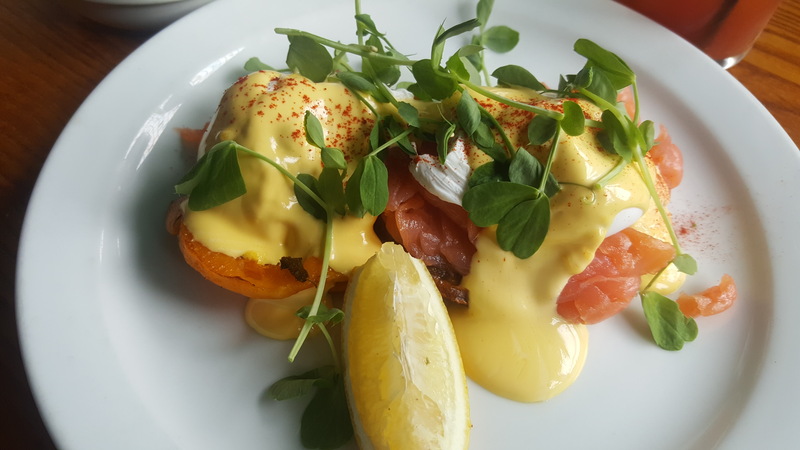 To nurse our hangovers the next day we went to The Breakfast Club and I had the gluten free version of the Eggs Royale which comes served on top of butternut squash. I was a bit apprehensive however it didn’t disappoint, the flavour was quite mild and went together very well. In fact, it’s a very good paleo option! One of my favourite things about train travel is the snacks (ha ha). I was meant to be on a Thameslink to London where I was going to stay with a friend, but luckily for me it was a Southern Rail so I got a table! Yay! (Thameslink don’t have tables grrr). 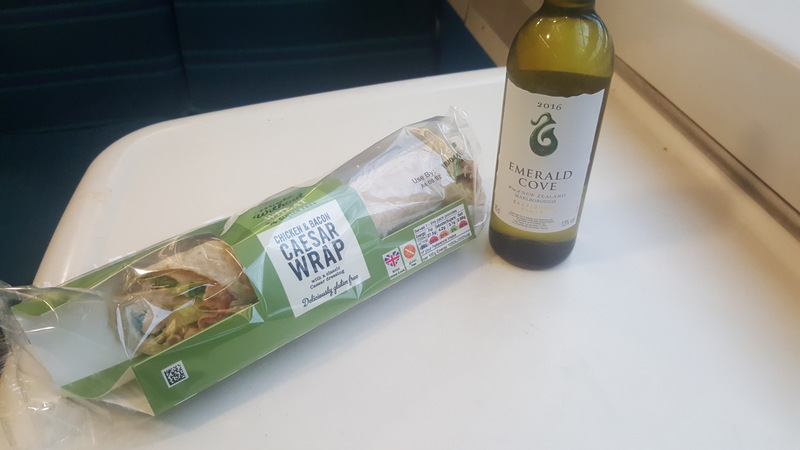 I found this yum gluten free wrap at M&S that tasted no different to a normal one and was full of caesar mayo, crispy bacon, salad and chicken. Highly recommended and this Emerald Cove wine is lovely too. One of the reasons for going to London is my friend and I were going to Uplyme to visit River Cottage and have a little country break! 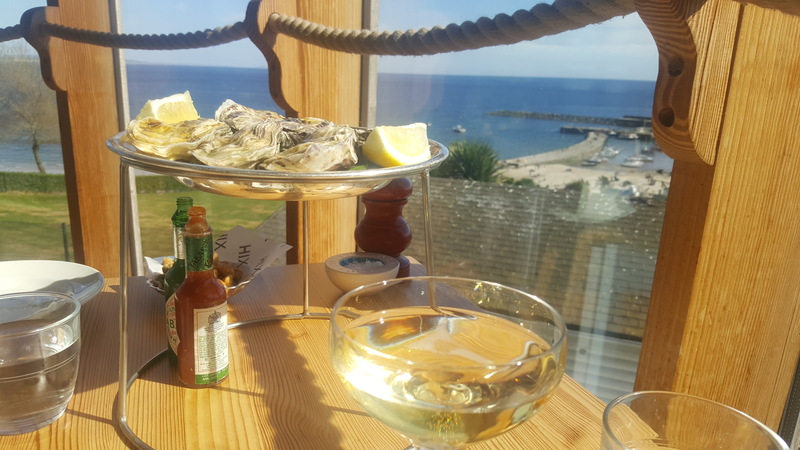 I wrote a blog about my time away as it was super lovely, above is a pic of where we stayed which I totally recommend for anyone heading that way. 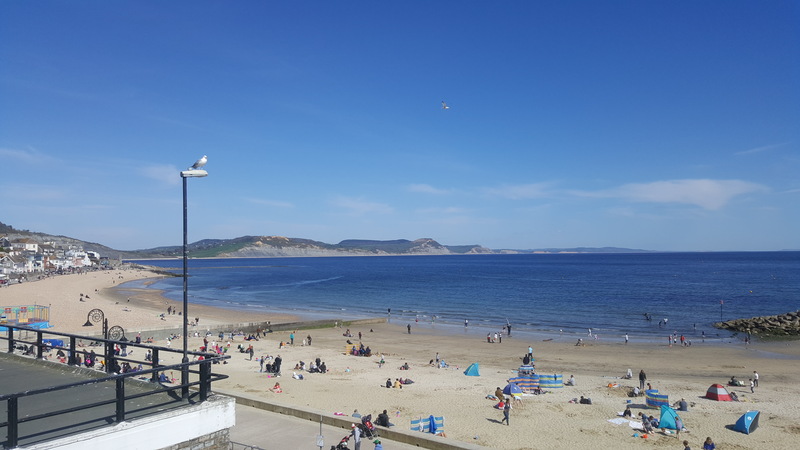 We were staying about a 30 min walk from Lyme Regis, a seaside town on the Jurassic coast that looks like that! It wasn’t too busy when we were there but I can imagine how packed it would be in the summer months. Not too nice I don’t think but definitely take a visit in the shoulder season! We made breakfast every day at the Cottage as they supplied us with fresh farm eggs and we bought extra bits from the shop. We also foraged wild garlic as seen in the pic above which was absolutely beautiful and a real treat! As we couldn’t get into River Cottage HQ we had booked into the Canteen in Axminster that was really great. I wrote a blog post about it which you can read here which is my honest review on the experience. I thought it was good, different and unique but a bit strange that they used suppliers from everywhere else aside from their farm. Maybe that is all used up at events at the HQ? I’m not sure. I had been following Beyond Bread Bakery on twitter for quite some time, they are a full gluten free bakery in London that looked incredible and offered lots of different things. We were a bit underwhelmed with the site itself and the service wasn’t great, however the bread and treats were very good. 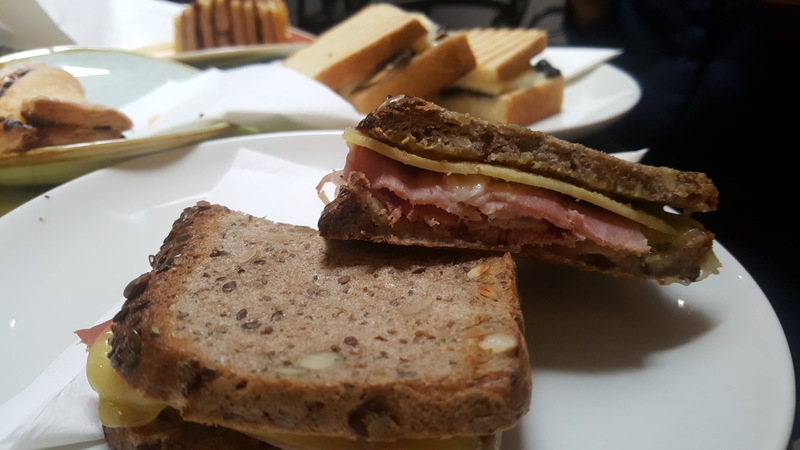 This is a pic of the ham and cheese sandwich I had where the cheese wasn’t melted properly, you know, just little bits of attention to detail I appreciate. 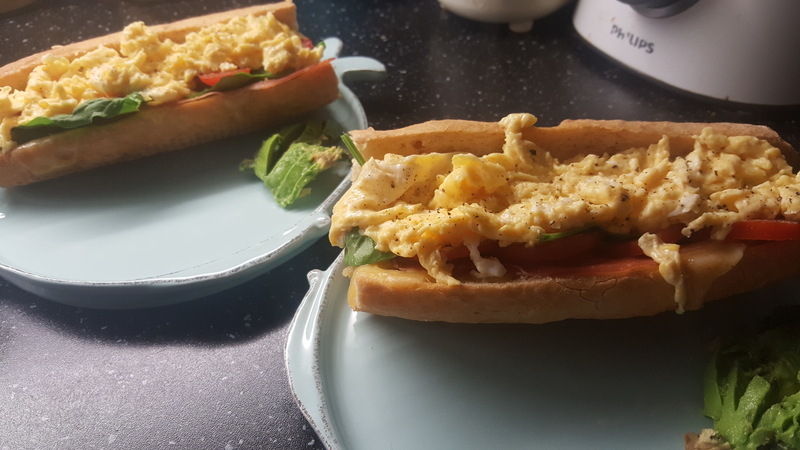 We took some of their baguettes away with us so I made us breakfast baguettes the following morning which I much say were pretty good! 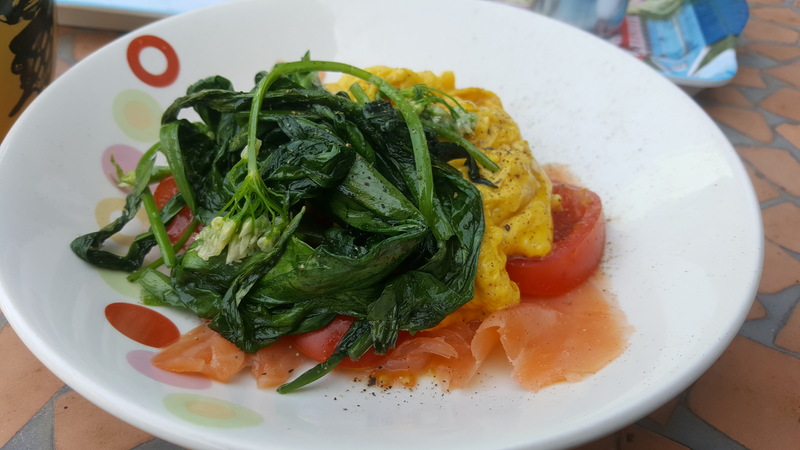 I included parma ham, tomatoes, spinach and soft scrambled and the baguettes were lovely and crunchy but soft in the middle. Definitely my favourite thing I tried from them! 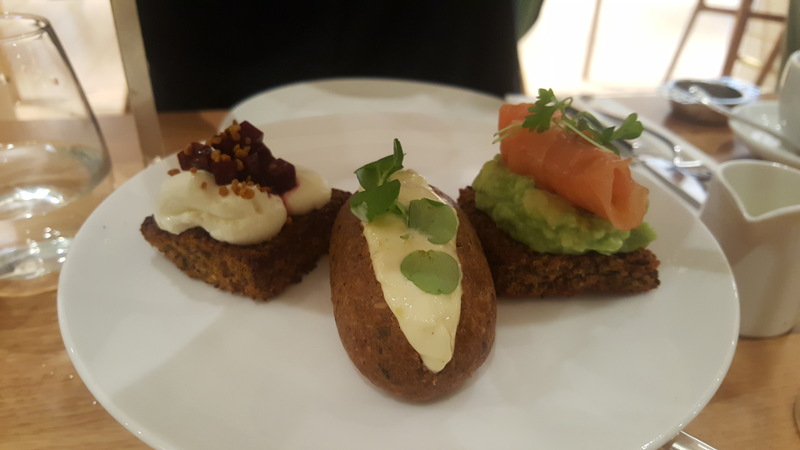 We had a bit of a treat in London and went to Hemsley and Hemsley’s cafe in Selfridges. Everything is made refined sugar free and wheat free so i could eat absolutely everything! The high tea was £39.50 with a glass of champagne and then we bought tea on the side but shared everything. I definitely think it was more than enough to share! On my last night in London I cooked a Vietnamese stew for my friend and her sister which was made with pork shoulder, aubergine and Vietnamese seasonings. It was super simple to make but did take a couple of hours to cook however I would recommend it. I might try and post a recipe on the blog as it’s definitely one worth sharing. We had it with leftover braised lentils, roasted butternut squash then plenty of coriander and beansprouts too. 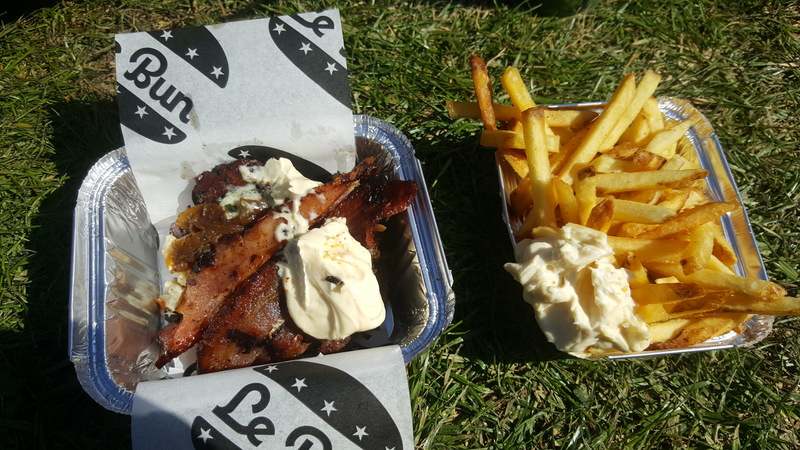 Last but definitely not least was the Le Bun Burger I had at the Foodies Festival over the bank holiday weekend. I went on the Saturday so it was still April and the weather was lovely and warm and sunny. Le Bun stood out to me as there was truffle on every menu item and I am obsessed with truffle. The staff were so so, not extremely friendly and a bit spaced out I think! I ordered mine without the bun but then found out after they didn’t have cutlery. It was a beef burger with truffle mayo, bone marrow jam, bacon and I got fries with truffle mayo on the side as well. YUM. I saw they were at the Great Escape this weekend too so you should try it if you see them again! That’s finally everything, if you got this far thanks for reading and sorry it was such a long one! I was a greedy lady in April as you can tell, but I hope it’s inspired you to try somewhere new. Have you been to any of the places above? What did you think?